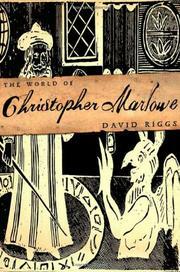 Because there is virtually no firsthand evidence about the beliefs or actions of Christopher Marlowe (1564–93), Riggs (English/Stanford; Ben Jonson, not reviewed) turns to the culture and time that created him. He does so with authority and vigor, recapturing the climate of religious flux and common disaster, not just in England but across Europe, that surrounded Marlowe’s youth. Riggs traces his subject’s passage from “poor boy on scholarship” (at the King’s School and Cambridge) to a dodgy adult life juggling “the tripartite roles of wayward scholar, secret agent and innovative poet-playwright.” Into the historical matrix he weaves Marlowe’s intellectual daring, his affection for every form of subversion, and his levitating touch on his homeland’s literature and drama as he “captured the lofty sound of Virgil’s epic verse in lines of English poetry.” Riggs devotes a good, and fascinating, amount of time to considering the possibility that Marlowe was a double agent in the employ of European powers seeking to destabilize English rule, but he gives equal measure to the writer who addressed poverty, class conflict, eroticism, and dissent. “The criminal element in his story, far from being accidental, was intrinsic to his life and art,” declares the author, finding in Marlowe’s work veiled expressions of the skeptical and libertine ideas that came part and parcel with his classical education. Riggs takes gorgeous lines like “I’ll fire thy crazèd buildings and enforce / Thy papal towers to kiss the lowly ground” (from King Edward II) and explains where they came from, how they shaped a whole new literary and social framework, and why they damned Marlowe in the eyes of some contemporaries as a godless blasphemer.